Lot of clients are now moving away from on premises Exchange and in to O365 these days. Exchange online came a long way and grown up a lot. 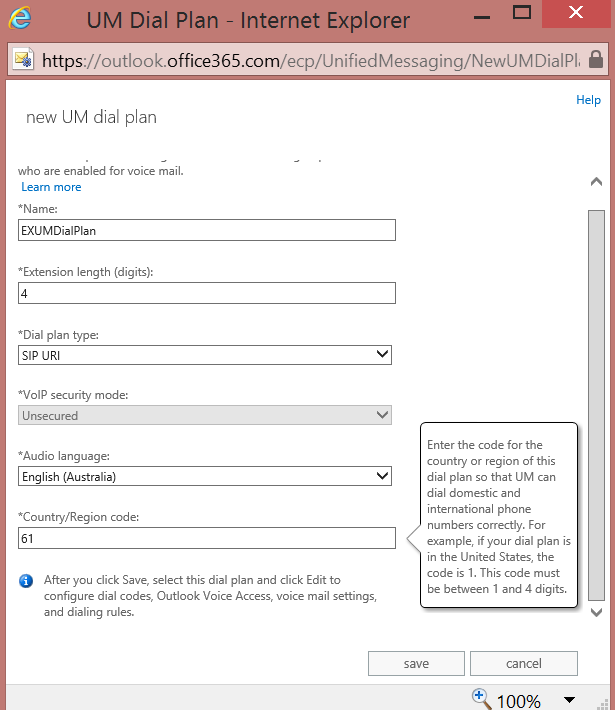 In terms of Unified Communications, how should we get Voicemail out of O365 exchange?. And what will be the configuration that involves in?. To answer those questions, let’s have a look at what the prerequisites are and what the configuration should be. Edge server DNS resolution should be done via the External interface and not over the internal. It must have public DNS servers configured instead of internal DNS. Form above mentioned 2 points, I cannot stress the importance of proper DNS configuration enough. If the DNS wasn’t properly configured, the whole partner federation component will get broken as a result and it will not be a pleasant experience. In above command, the Organization parameter must be specified as the tenant name and not the shared name space. Ex, contoso.com (shared name space), contosoltd.conmicrosoft.com (Tenant Name). Then run; Invoke-CsmanagementStoreReplication to replicate the changes. 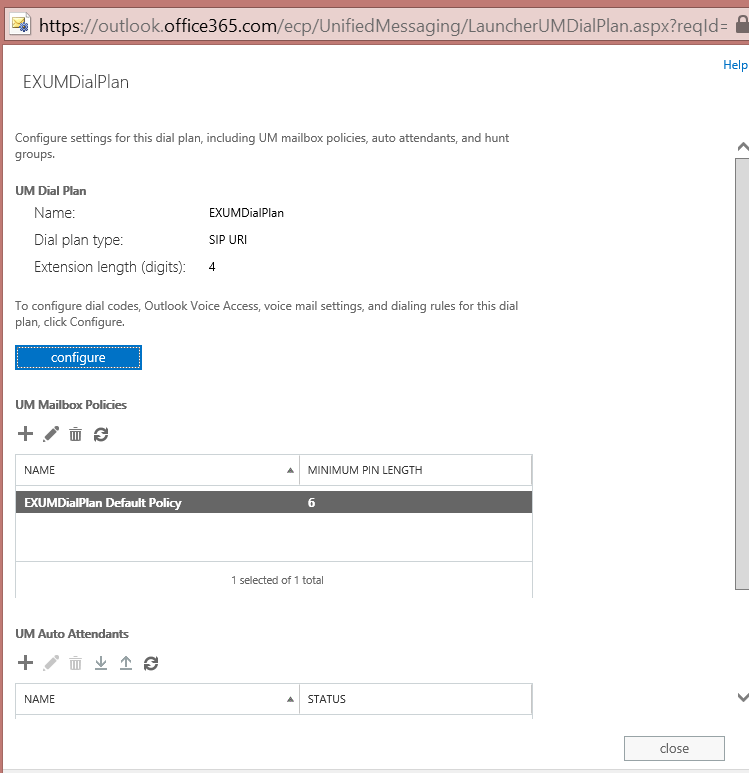 Now to create UM contact object for Subscriber access and Voicemail. Usually for on-premises Exchange, we use OCSUMUtil.exe tool to create these objects. 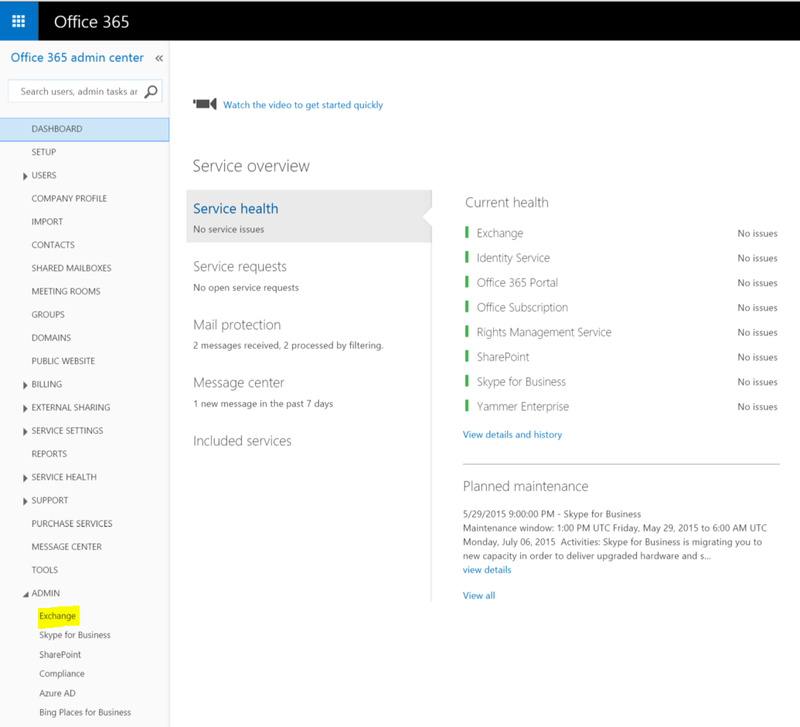 But in O365 UM scenario, we have to use Lync Server management Shell to create these objects. In order to create the contact object for Subscriber Access, the command; New-CsExUmContact -SipAddress sip:exumaa1@domain.com -RegistrarPool lyncPool.domain.com -OU “OU=ExUmContacts,DC=domain,DC=com” -DisplayNumber -AutoAttendant $False -IsSubscriberAccess $True can be used. 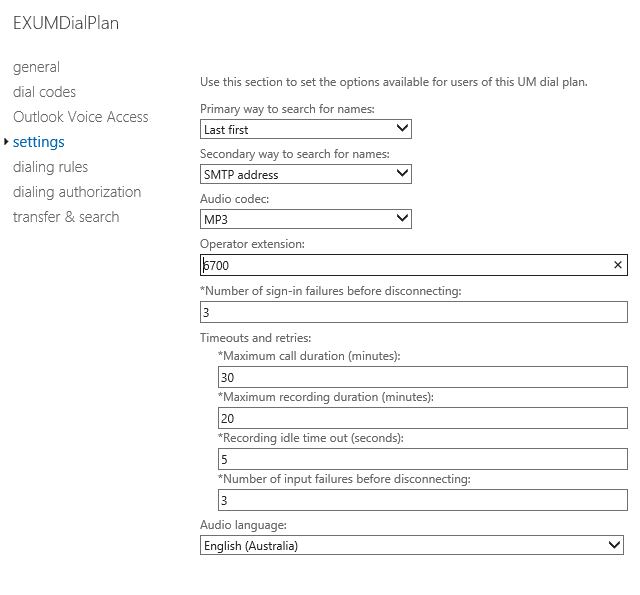 Now we are done with Lycn server bits and move on to O365 portal to configure the UM Dial Plan. Log in to the O365 portal using https://portal.office.com and go to the Admin Centre. Go to “Exchange” and select “UM Dial Plans”. Select “+” to create a new dial plan. Configure the dial plan name, number of digits of an extension. Select “SIP URI” from the drop down for “Dial plan type”. Set the language, the country code and save the configuration. Open the newly configured Dial plan and select “Configure” to configure the rest of the parameters of the dial plan. 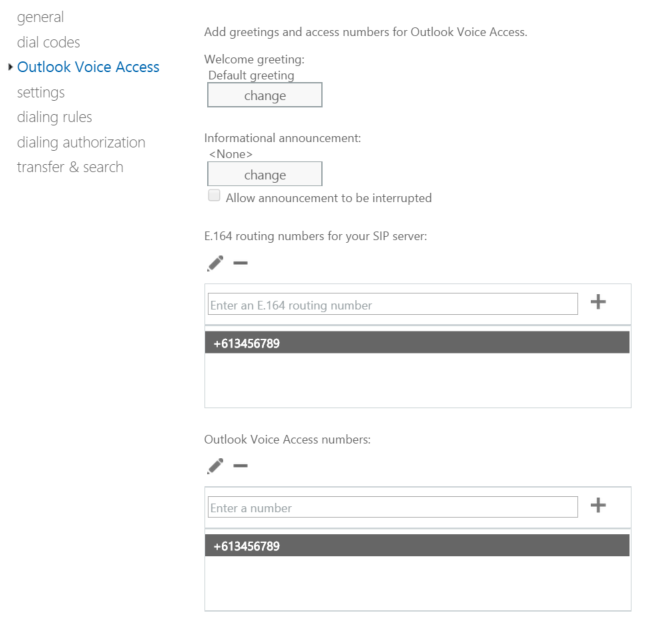 Move to “Outlook Voice Access” tab and configure the DID number for the Subscriber Access in E.164 format as shown below. If you want to use a custom greeting, the audio file can be uploaded in to the “Default Greeting” configuration. Then go to “Settings and configure the operator extension. This will help to transfer the calls to the operator, if the caller couldn’t be served by the subscriber access component. 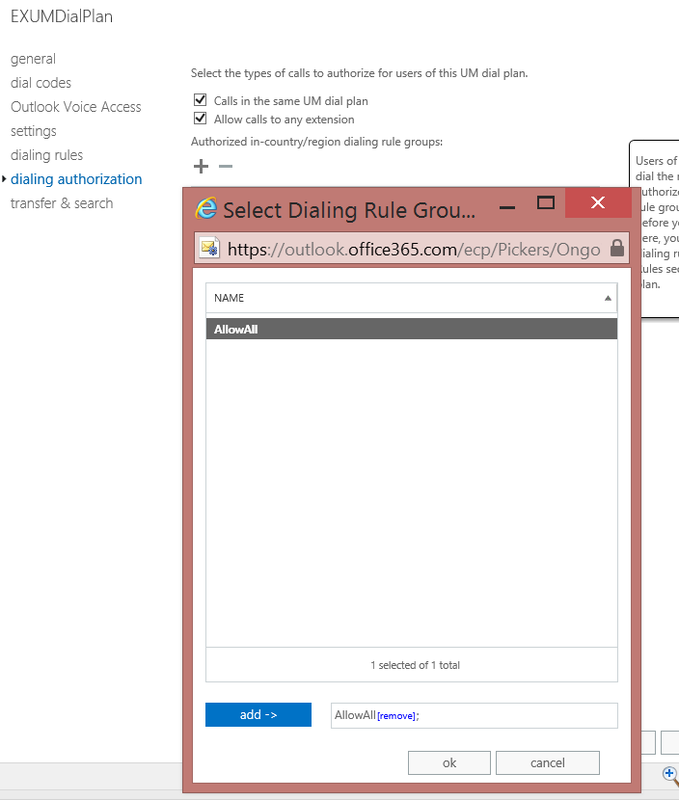 Next to configure the “Dialling Rules”. Dialling rules are configured to dictate which number or number patterns can be routed via the subscriber access as well as the auto attendant. Usually, the dialling rules are configured to route all digits without any restriction, unless if there’s a special requirement that need to configure specific numbers. Configure the dialling rules as mentioned below. This dialling rule will be later on assigned to the Um Mailbox policy as well. Now to assigned the dialling rule to the dialling authorization table. Configuring this will allow users who are coming in to the Subscriber Access and Auto Attendant to reach out to internal user extensions. 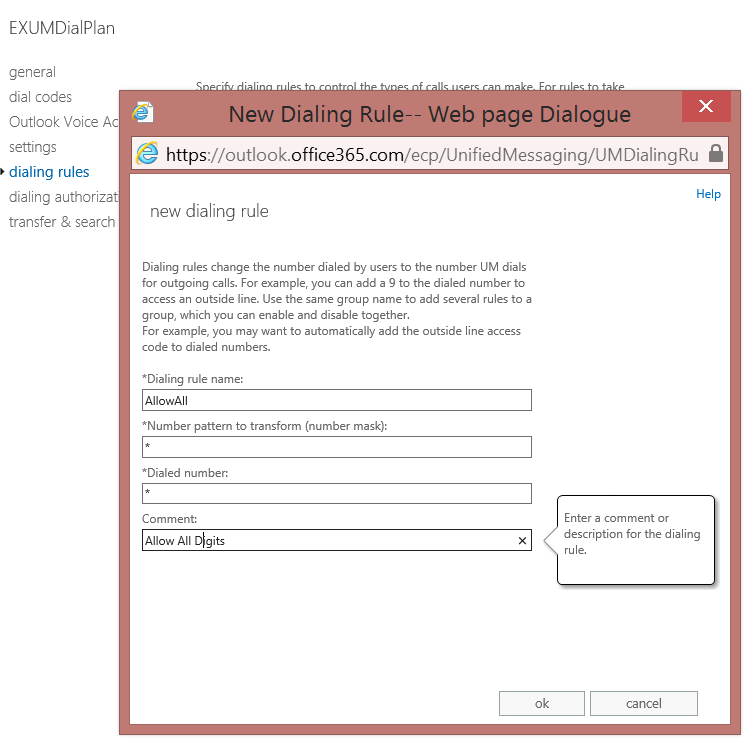 Assign the dialling rule to the authorization table and check “Calls in the same dial plan” and “Allow calls to any extension” components. In Transfer and Search tab, verify that the “Transfer to Users are selected. The rest of the parameters can be left alone. 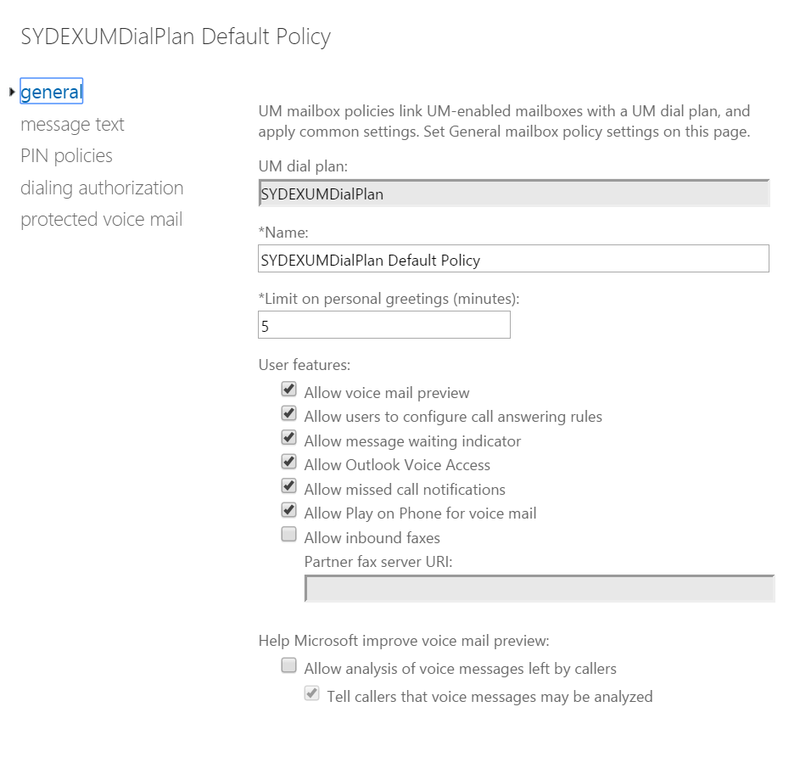 Now, go back and open up the configured Dial Plan and double click on the default UM Mailbox Policy. This policy get created automatically upon completion of the UM dial plan creation. In “General” we usually leave the parameters as it is. If required, some of the UM functionalities can be controlled within this section. In The “Pin Policy” tab, you can change the number of digits that are required for the PIN and whether to allow the common patterns for the PIN. Usually, the PIN would be set to 4 digits length and allow common patterns. 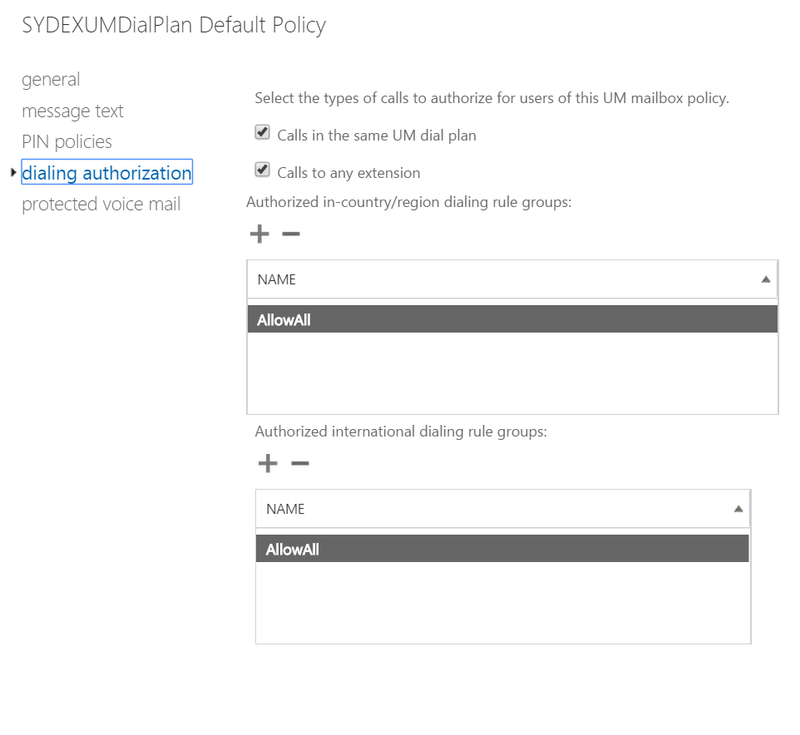 The “Dialling Authorization” is the most important part within the UM Mailbox policy. 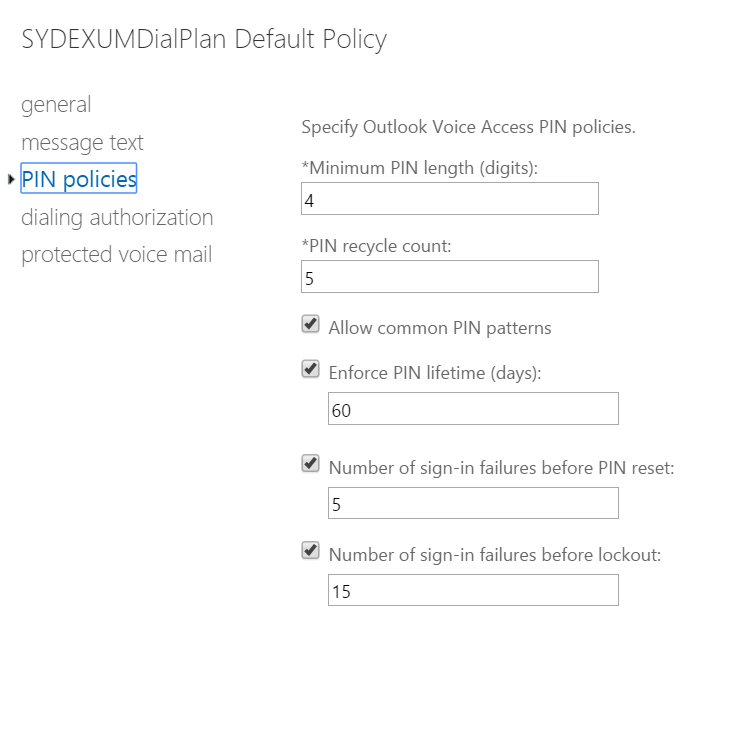 If not configured with a number policy, it will not allow calls to be routed to internal extensions from the subscriber access or auto attendant. 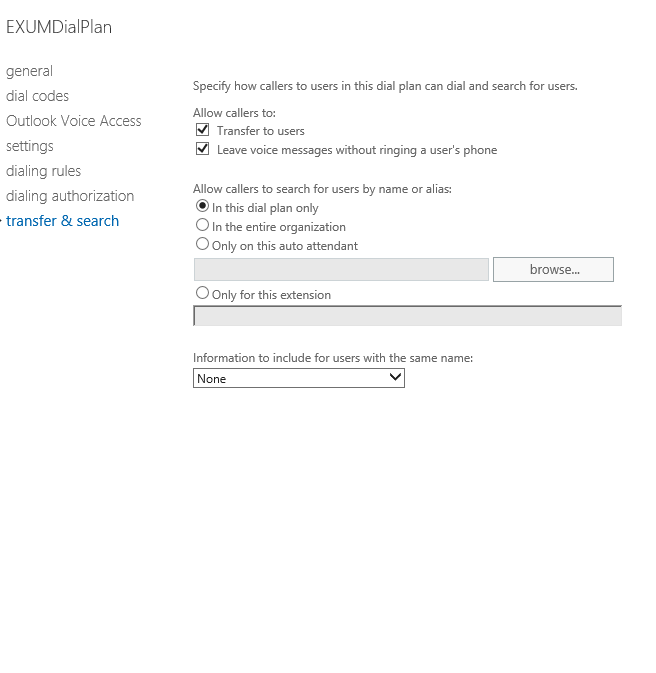 Assign the previously configured number policy to allow all digits and “Calls within the same UM dial plan” and “Call to any Extension” should be checked. This is all that is to the Subscriber Access component of the Exchange UM in O365. The same steps can be followed to configure the Auto Attendant. It will require to configure a UM Object for the Auto Attendant in Lync Server and then need to configure the Auto Attendant within O365.